Speaking of which, can she read? Or does she just love the idea of being able to? Was her religion passed down to her orally? I wouldn’t think Hedda could read since she was a thrall for probably most of her life. Maybe they’re pretty doodles, Loki. Reading! Writing! …So subjective to language… and yet, I totally sympathize with Hedda wanting to learn how to read. And Loki, that’s half the point! If you’re going to all the trouble to write something, why not make it fun to look at, or pretty? Great work, Ibrahim. Now she´s going to pester you to teach her to read. Did you have fun calligraphying the fourth panel, Sarah? Uh FUN? I’m always just concerned about it making sense. Huh. Would’ve thought that Loki being a god would be able to read that, even if he is a Norse god…oh well. Mmm, Arabic script is so pretty! I’ve studied a teeny bit of Persian; I can pick out some pronouns here and there. Yeah it’s beautiful! Can be tricky to copy though, I’m not sure if I’m losing some nuances or not. Oh well. 1: I don’t know any Arabic. 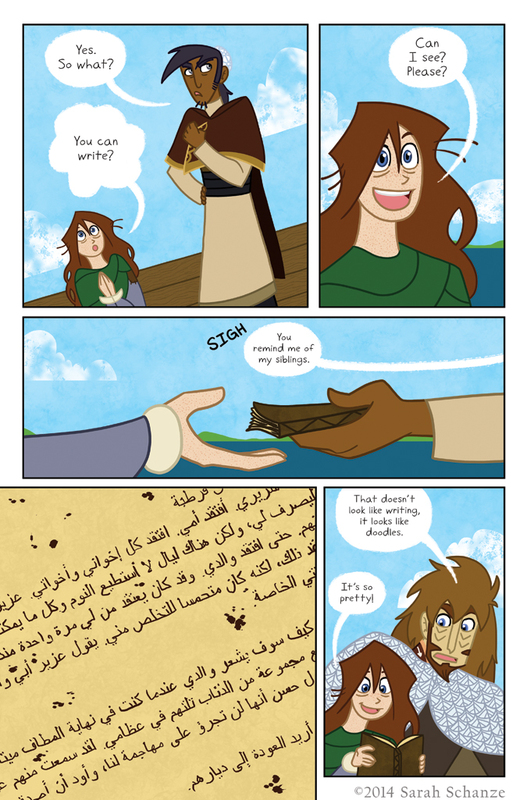 Is Sarah slick enough to sneak in a bilingual bonus by having that page of Ibrahim’s journal be in actual, accurate Arabic (and translatable)? 2: Is anyone else reminded of that scene from “Thirteenth Warrior” with the one Norseman learning to write in Arabic? 1: I wrote down some stuff from Ibrahim’s journal into Google Translate and copied it over. It hopefully makes enough sense to understand, but it’s not necessary that anyone can read it. It’s more for effect. But, if you can read Arabic, I guess it is a kind of bonus. 2: I have not seen that movie or read the book! Though I’ve gotten a few mentions of it, hahaha. I’ve always enjoyed The 13th Warrior, but someone schooled in Nordic lore and history might not find it as enjoyable. On the other hand though; Antonio Banderas! Don’t say that stuff, Loki. That means Coal will have to one-up your grumpiness. He’ll probably end up setting the book on fire or something. Hahaha, Coal can be a jerk but he’s not that big a jerk. 😀 There is a 100% possibility I copied it over incorrectly, so yeah. It’s really just a page of Ibrahim’s whining. Most of the pages are like that, haha.